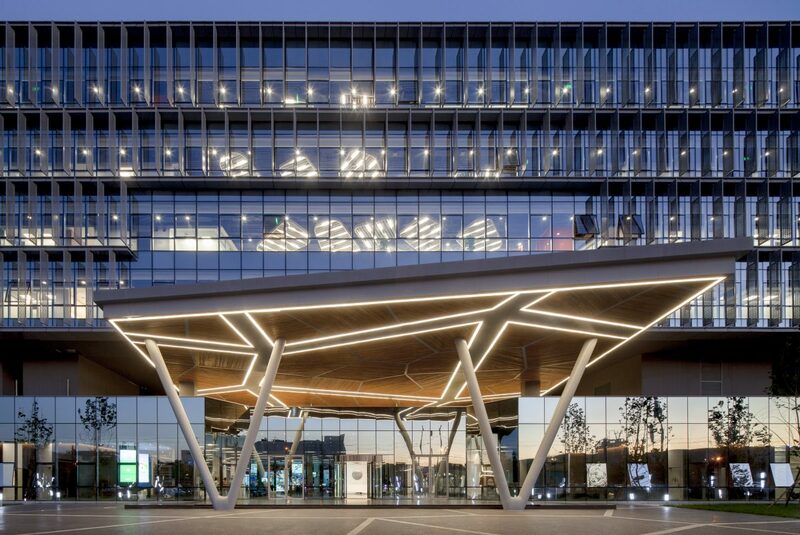 GE’s Beijing office building surrounds a large open courtyard, and houses offices and staff facilities as well as display areas for the company’s products and services. 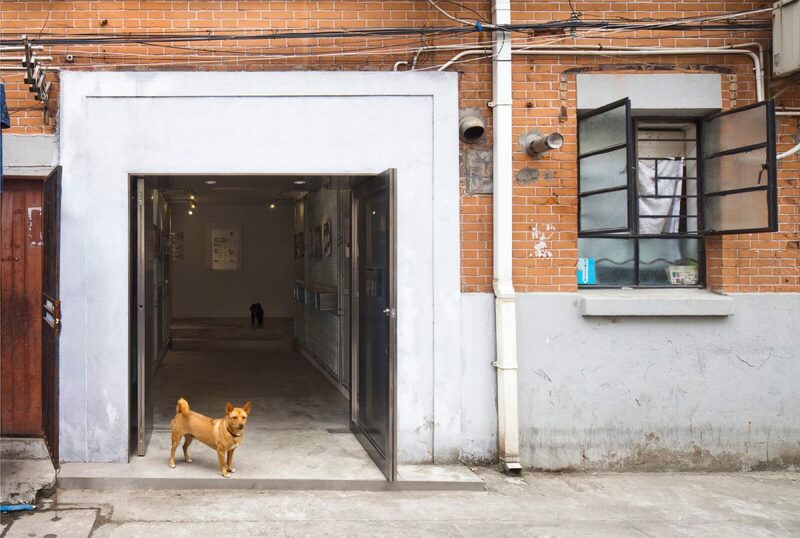 SHL have remodelled an existing office building for use as an incubator for hi-tech start-up companies. 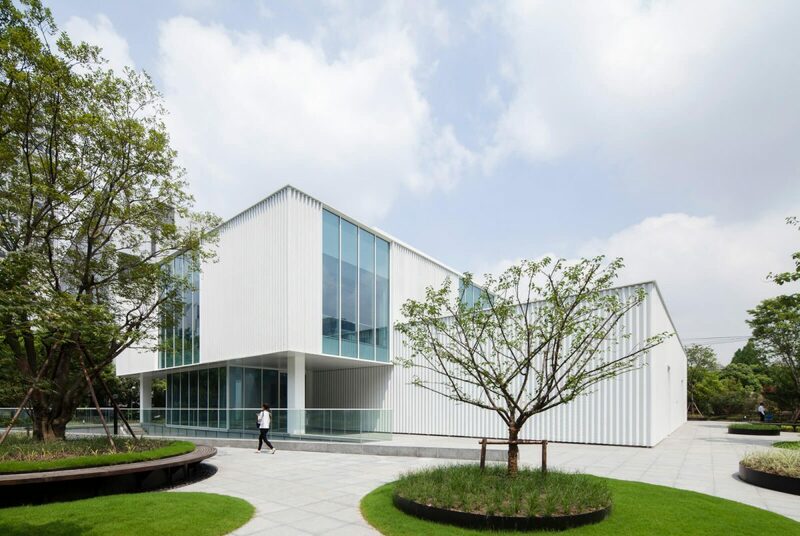 A new facade of white, undulating, perforated, powder-coated aluminium envelopes the building. This covers some but not all of the building’s windows offering varying degrees of visibility and shade. A new central atrium has been created allowing more daylight into the core of the building whilst serving as a central connecting space. Here a mural by shanghai-based artist,the Orange Blowfish, spans three floors up through the atrium along one flanking wall. Casual seating, a suspended meeting room, and a number of planted outdoor terraces provide alternatives to more traditionally arranged office spaces. The Onehouse have designed a new office for themselves. The main spaces are finished in an austere palette of black and white, with grey flooring. Planters of greenery, cacti and snake plant, provide a break in colour and form, their rounded stems and pointed leaves contrasting with the simple, rectilinear approach employed throughout. 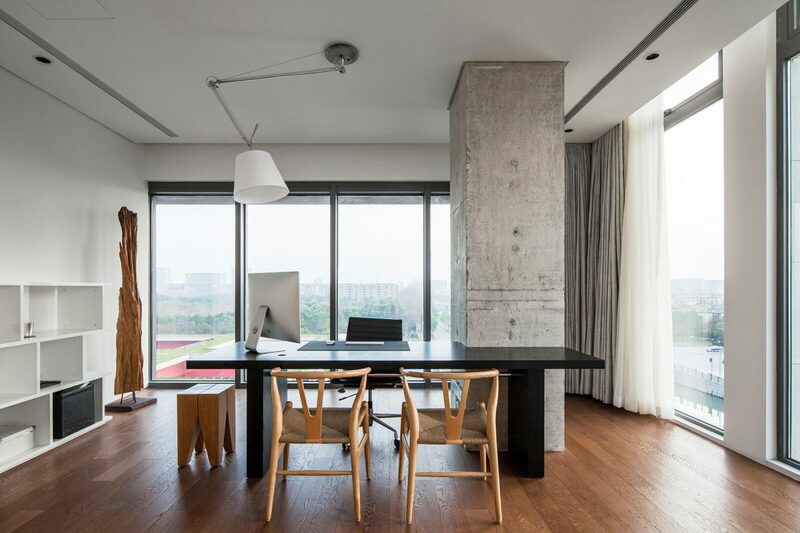 Moving into more private offices and meeting spaces natural wood flooring and furniture, coloured chairs, and tungsten lighting soften the atmosphere. JW & Associates is a multidisciplinary design firm whose practice includes interior design, product design and architecture. The initial concept of this design was to create an office environment accommodating diverse emotional and working states from the calm and solitary to excited group exchanges. The first stage was the abandonment of excessive ornamentation in favour of function and practicality with a simple colour palette of white, grey and warm, natural wood. The design’s primary feature is a meanderous central island which, running the length of the office’s central space in a series of waves, provides desk space and varied seating, as well as dividing the room. In addition the incorporation of stands of bamboo creates a soft and naturally varied form of division between the room’s two halves. Its continuous curve divides the space without creating discreet segments. A connecting corridor runs the full length of the office joining closed offices at the far end via the central working area to a kitchen and snack bar adjoining the reception area immediately before the main entrance. A separate conference room further divides the kitchen area from the main office. Double doors at either end of the main office area can be used to isolate each area as required. The reception desk utilizes off cuts leftover as waste material from the construction of the remainder of the project. A counter running the length of the kitchen area is coated with TK PET resin which runs down its side to form a continuous surface with the floor of the reception and kitchen area. 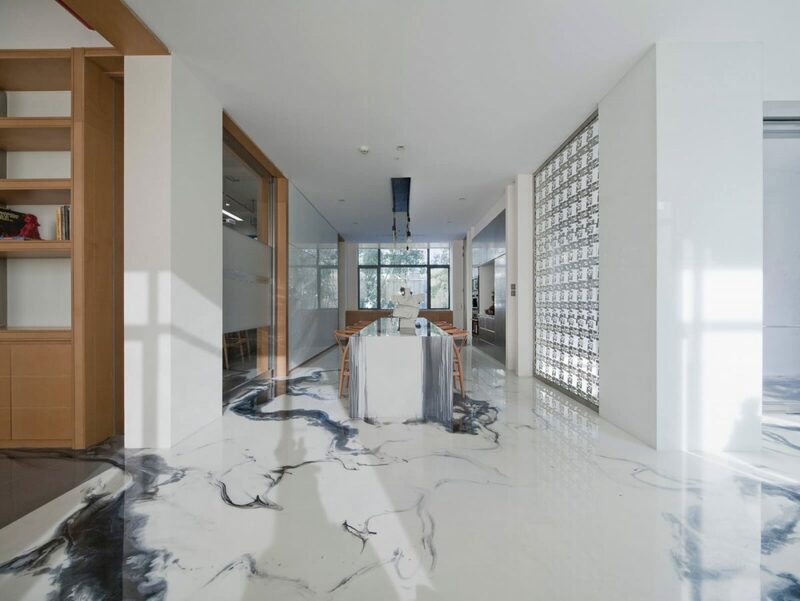 The clear resin is marked with large brush strokes of Chinese ink and flows over the floor’s boundaries into the central office area and meeting room giving the impression of standing water. Lukstudio have completed this new office for themselves. Wrapped around a glass walled courtyard with a tree at its centre, the office emphasises flexibility in use and is amply lit with natural light.